What is a Non-Resident Nie in Spain? Documentation and Requirements who can have a non-resident visa and who can apply for it. Living Legally in Spain: What is a Non-Resident Nie in Spain? Are you considering starting to live in the Spanish territory? Then there are many legal issues you will need to handle. If you are looking for information regarding immigration to Spain and you don’t know which are the required documents that you need in order to enter the country, here you’ll find out some answers. 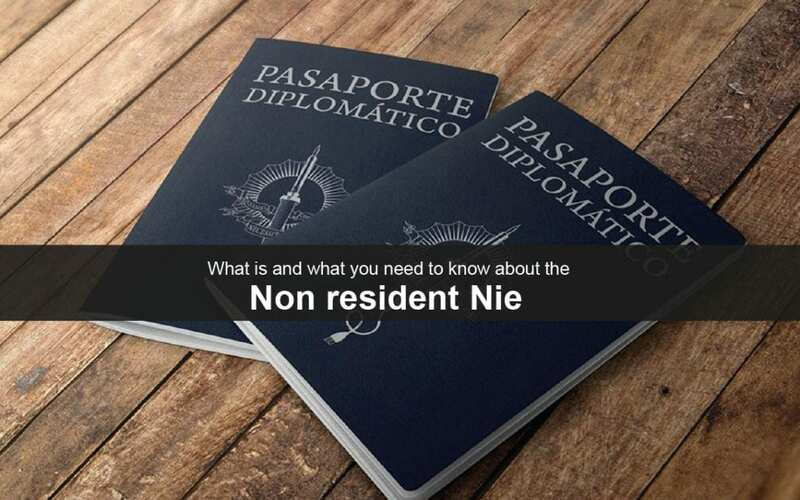 There is no doubt that one of the most important documents you need to acquire in order to live in Spain is the NIE. Been new in this topic, probably you might be wondering; what exactly is the NIE? Why is this immigration document so useful? This document is denominated “Número de identificación del extranjero” (foreigner identification number), and is emitted by the General Police direction of Spain for the ones that have a resident permit in the Country. Generally is acquired by those people that are not Spanish citizens and need a permit to live. However, this number can be given to others who don’t want to live but want to do any investment inside Spain. The NIE is useful in both cases. To sum up, any kind of paperwork you must do in Spain as a foreigner will require the NIE number. The resident NIE number is given to the European Union citizens who want to live in Spain. The Non-Resident NIE is the document given to Non-European Union Citizens or foreigners who want to acquire any property, build a society, open a bank account or even buy a vehicle inside of Spain. In this case, the non-resident Nie does not give you the right to live or work inside the country as is used only to identify you. This Number is perfect for the ones that want to do business in Spain or invest without having been living in Spain. Generally, once you get the number, you will maintain that same number even if you apply for your residence permit afterwards. It takes approximately 3 weeks to get your non-resident NIE number once you have applied for it. If you want to save money and get your NIE as fast as possible, without having to worry about any paperwork needed, don’t hesitate to get in contact with us. We will assist you through the whole process and even help you with the documents that you need (you will just need to sign). We will help you along till you have it. For more information write us an email or arrange your appointment at info@ballcellgroup.com, and we will provide you with more details. Hello, I am an American citizen residing in France legally (married to a French citizen), but still on a USA passport. I have been living on and off in the Canary Islands for many years. Am I eligablbe for a NIE? I would like to buy a car here. I have no legal status in Spain.Thank you! Post brexit which nie is required to continue living in Spain? Once the whole negotiation process comes to an end, you will need the non-resident NIE. That is why we suggest you start as soon as possible getting your NIE now that everything is still being debated, as it will be easier for you. I have a NIE number sine twenty years ago and never bothered to renew it so I do not have the so called green card etc. I have running business and paid self employed stamps for over 15 year and Spain is the only country I pay taxes from global income. I will become the President by mayority shareholding of a chain of hotels and wonder whether I can be cause problems unless I sign what they call El Padron. As your case is really specific, it would be best if one of our specialized lawyers helps you out directly. For that, we would really appreciate if you could send us an email at info@balcellsgroup.com, so we can start as soon as possible. Thank you very much for reaching out to us, we will be glad to help!